Bowel cancer is a general term for cancer that begins in the large bowel, and can sometimes be called colon or rectal cancer, depending on where exactly the cancer starts. It is one of the most common types of cancer diagnosed in the UK, and is most common in people over the age of 60. As the symptoms of bowel cancer can be subtle, it can be detected by looking at your bowel habits to see if there are any changes. One symptom which could be a sign of bowel cancer is blood in your poo, especially if the blood is dark. In most cases, blood in the stool is from piles, especially if it is bright red, fresh blood, according to Cancer Research UK. Piles are like swollen veins in the back passage. These veins are fragile and can easily get damaged when you pass a bowel motion, causing a little bleeding. Piles usually come with other symptoms too, so if the only symptom you are experiencing is blood in your stools, it is unlikely to be piles, according to the NHS. Blood from higher up in the bowel, meanwhile, doesn’t look bright red, but goes dark red or even black. This can make your bowel motions look like tar, according to Cancer Research, and could be a sign of cancer higher up in the bowel. It could also be a sign of something else, like a bleeding stomach ulcer, so it is best to get it checked out. 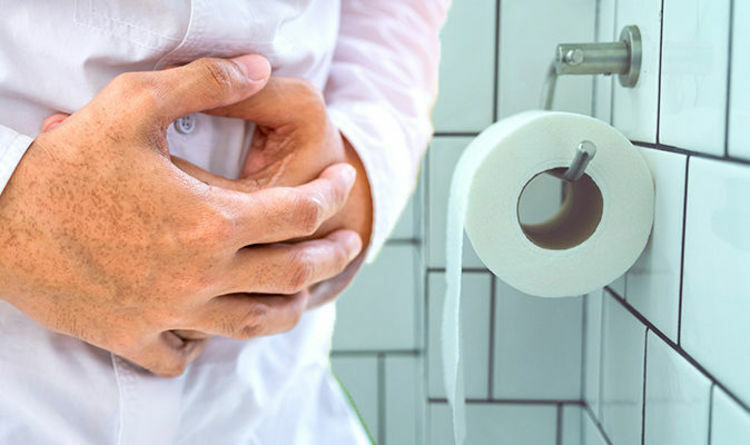 According to the NHS, more than 90 per cent of bowel cancer patients experience either blood in their stools, persistent changes in bowel habits, or abdominal pain. Changes in bowel habits could include needing to go to the toilet more often and passing looser stools. Abdominal pain, discomfort or bloating would always arise when eating. Constipation, however, is rarely caused by serious bowel conditions. Most people with these symptoms will not have bowel cancer, but you should get it checked out just in case. Other symptoms of bowel cancer are a lump in the back passage or tummy, loss of weight, and tiredness and breathlessness. A feeling of needing to strain in your back passage, as if you need to poo, even after opening your bowels, is another symptom. In some cases, bowel cancer can stop digestive waste passing though the bowel, which is known as a bowel obstruction. A bowel obstruction is a medical emergency. Symptoms include intermittent abdominal pain, weight loss, constant swelling of the tummy, and vomiting. “If you have one or more of the symptoms of bowel cancer, and they persist for more than four weeks, you should see your GP,” said the NHS.